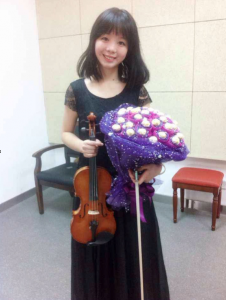 Lulu started to learn violin from age 4 with professor Liao,who is the concertmaster of Fujian Symphony Orchestra. Before she came to Sydney, she completed her bachelor of violin performance in Xinghai Conservatory of Music and took charge of the concertmaster of Xinghai Conservatorium Symphony Orchestra. She was studied under Pr.Goetz Richter in Sydney Conservaorium in her post-graduate degree. She performed in numerous orchestras including Sydney Symphony Orchestra, Shenzhen Symphony Orchestra Sydney University Symphony Orchestra and Sydney Conservatorium Symphony Orchestra, working with international conductors David Robertson,Vladimir Ashkenazy, Jessica Cottis, Christain Ehwald and Franz A.Krager. She has been teaching violin since 2010 and she has experiences in teaching all ages which including beginners and advanced players, She guides students with love and patience to achieve highly in examinations and competitions, especially focus on practicing basic skills in proper methods and motive student’s interests in violin playing.